10 of the Best Oktoberfest Celebrations in America! Gemutlichkeit (which is a broad term but can translate to warmth, friendless and good cheer in German) is truly what celebrating Oktoberfest is about. This traditional German festival is about getting together for good food, good beer and good times, and to celebrate German heritage. The original festival is held in Munich, Germany, where people consume about three Olympic swimming pools worth of beer, or nearly two million gallons. Outside of Munich though, it is celebrated all across the United States. If Cincinnati alone attracts over half a million people for the celebration every year, you can imagine it's a pretty big thing all over the nation. And a good reason to eat, drink and be merry! To enjoy an authentic, German festival experience, here are the 10 best Oktoberfest celebrations in the U.S.
Big Bear Lake sure does it big for Oktoberfest. With over four decades of celebrating German heritage, Big Bear Lake Oktoberfest feeds its visitors traditional bratwurst, knockwurst, and Bavarian dumplings with the very best German beers you can find. Expectedly, the celebration holds beer-drinking contests and stein-carrying competitions along with live music from German-based bands. For the parents, don't worry about finding entertainment for your kids. There are petting zoos, pony rides and carnival games for the younger crowd to enjoy while the 21+ bunch sips on German brews. Kicking back for a tasty German beer is relaxing in itself, but doing so while taking in the picturesque views of the San Francisco Bay is even better. The party really gets rolling when the legendary, California-based Chico Bavarian Band (a 21-piece traditional brass band) shows off their musical talents. The Nature Friends Schuhplattler performs traditional Bavarian dances every few hours, and will teach visitors a thing or two about the dance. The Mile High City's Oktoberfest draws over 350,000 people over a six-day festival. USA Today named the celebration the "Best Oktoberfest" in the United States, and it is one of the largest beer festivals in the country. Just as many Oktoberfests go, Denver's celebration features German music, dance, and traditional foods. But something that separates Denver from others is their annual Stein Hoisting Competition, which challenges participants to hold 1.5-liter stein, filled with ale, at shoulder-height for as long as they can. Dancing along to traditional German music is highly encouraged at New Ulm's celebration. Local bands and German-style polka performers really get the crowd going, and bring immense pride to those of German descent. Along with the music, the celebration features horse-drawn trolley rides, delicious food vendors with authentic German cuisine, and the famous Schell's Beer Wagon. Over 60,000 people flock to Tulsa to celebrate German heritage every year at the Linde Oktoberfest. With as many beer kegs as your heart desires, Linde's Oktoberfest is very similar to that of the original in Munich. Snack on scrumptious Bavarian cheesecake and pair it with a classic German brew. And for some extra entertainment, sit back and watch the famous Dachshund Dash. Yes, there is a wiener dog race at this Oktoberfest. Does it get any better than that? This city's fun-filled fest features live music, traditional dancers, car shows, alcohol and of course, the always-yummy authentic German food. Polka dance the night away in the Biergarten building and enjoy traditional German entertainment in the Alpinegarten. With the seemingly endless booths and vendors, you will consume enough food and beer for a lifetime. This is the time to celebrate all things German. This expectedly-big Texas celebration of German heritage was once known as the "Sausage Festival." Today, this 10-day celebration showcases vendors with Bavarian foods and products, a craft beer garden, and the famous Bavarian Masskrugstemmen (which translates to "beer-stein holding"). 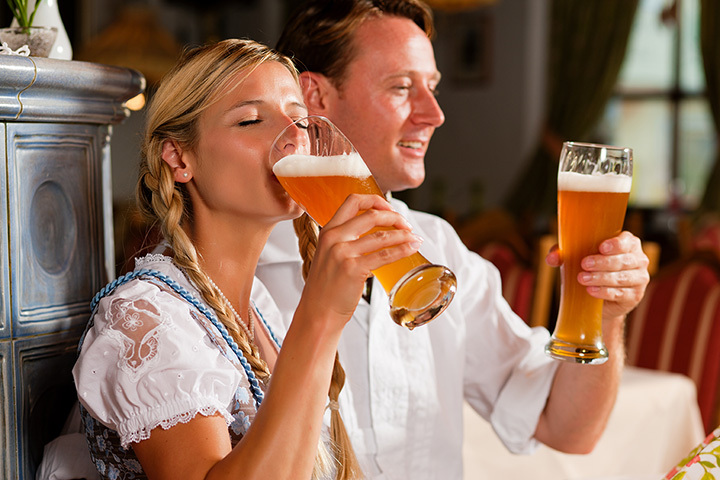 The traditional Bavarian challenge tests contestants' strength by requiring them to hold out a one-liter beer stein in an outstretched arm for as long as they can stand it. The Leavenworth Oktoberfest is something to remember. With live music, German food, arts and crafts, and plenty of activities for everyone in the family to enjoy, Leavenworth has it all. And if you think you may be throwing back a couple of beers while you're here (of course you will be), don't worry. Inside of Leavenworth during these celebrations, there is a free shuttle service to cart your tipsy self around the whole day. Its official website deems the celebration "one of the few authentic Old World folk festivals held annually in the United States." Plans for a city-wide celebration began in 1960, and in October of 1961, La Crosse's inaugural Oktoberfest celebration was held. The festival features food trucks of traditional bratwurst and other local favorites like cheese curds and deep fried pickles. Each year, the festival kicks off with the Edelweiss Parade where the Oktoberfest La Crosse Royal Family marches with a band through the streets of the city.